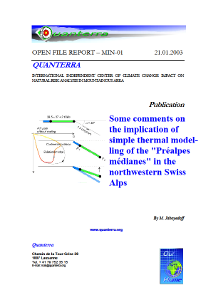 Abstract: Metamorphic temperatures and ages of the Préalpes Médianes units (Switzerland) are compared to a simple geometrical thermal modelling using finite difference method. Even if the used model is simple, the order of magnitude of maximum temperature ages agreed with available data. The model confirmed that the internal part of the PM might have reached 250-300ºC. The calculated ages of 26 Ma for the maxi-mum temperature is found to be compatible with the ages of 27 Ma deduced from illites dating. Jaboyedoff, M., Béglé P. & Lobrinus S. (1996) Bull soc. Vaud. Sc. Nat. 84.2,: 191-210. Abstract: The Furgg zone consists of three units. The first one, the lower Furgg zone, is made of gneiss, the second one, the middle Furgg zone, is a Mesozoic series crosscut by mafic dikes and the third one, the upper Furgg zone, consists of gneiss, meta-arkose hosting numerous boudins of mafic rocks. This last unit has been assigned a Middle Jurassic age. The studied area is strongly affected by backfolding. These folds are associated to the classical E-W dextral shear zone. The value of the direction of Shear is around ~280°/40°. This interpretation is compatible with the reorientation of the older structures.